If you live far away from your lover, this project could make you feel the presence and the emotional state of your partner without making voice calls. Two stationary anthropomorphic robots are used as tangible user interfaces that can mimic human emotions by displaying symbolic facial expressions on low-resolution screens, in order to reflect the emotional state of the user. The system allows its users to casually express their emotions over a distance through dedicated networked objects. El Niño is currently a functional work-in-progress prototype. The system was built and designed using a combination of open source hardware and a 3D-printed enclosure. Find out more on the project on Weng Xinyu website. I live in a long-distance relationship and I really think this is something that could make live a bit easier. Sometimes there is a big lack of nearness, because of too less time together. 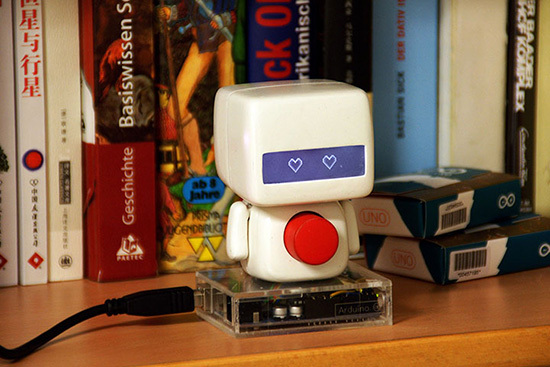 This little robot doesn’t do much, but it gives a bit the feeling of beeing near to each other back… Great idea!! I saw it in the Maker Faire Rome last october and I was overelmed of the emotional link it can create. Maybe you can take inspiration from that project too.